Return flights from London to Koror, Republic of Palau from £550! Qatar Airways 10% discount from Germany to selected destinations! Looking for unique, remote (but also not cheap) destination check out this promotion based on SkyTeam carrier China Airlines. Return flights from London to Koror, Republic of Palau in Micronesia are available from £550 also adding updated solution to Guam from £492. Fare is for a round trip incl all taxes and checked bag. Flights require long layover in Taipei on your way you would have to accept. This is a good opportunity for a side trip and explore another city. Find below currently the cheapest flights from the UK to Palau and book discounted deal with China Airlines with one layover in Taiwan.. If interested in this deal you will find only few options from March to June or September to October 2019. Max stay 1 month. Book this promotion with China Airlines by 31st of March or available until the cheapest seats last..Note that both Guam and Palau are definitely not a budget destinations. You can make an idea about price for a hotel room via Hotels.com or Booking.com. 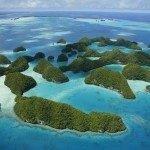 Booking sample of cheap return flights from London to Koror, Republic of Palau from £550! In this case you would depart from the United Kingdom to Guam on 27th of April. Inbound flight from this remote exotic holiday destination in remote Oceania back to London Gatwick would be on 13th of May 2019.